Description of decorations: The large trunk of dead wood is a Dracophyllum latifolium (commonly spider wood), in addition there is driftwood on the right-hand side of the tank and mangrove branch lying close to the surface. The majority of leaves are magnolia, artocarplus, and oak leaves. 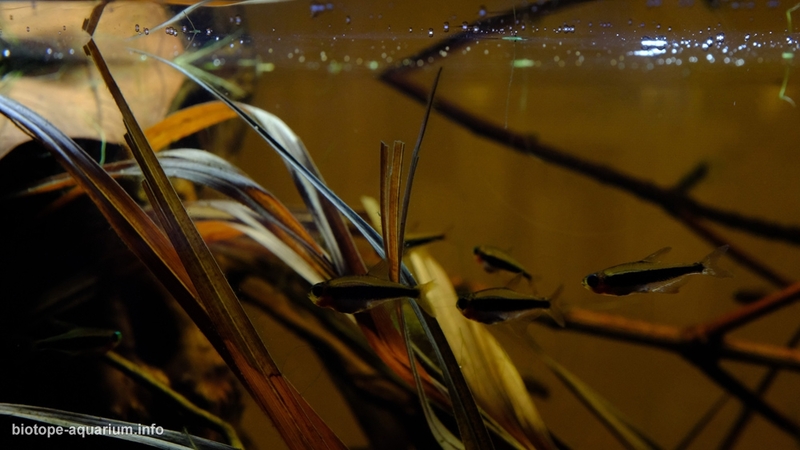 In addition, the forest detritus is spread across the aquarium providing its inhabitants with a natural “forest floor”. The forest detritus includes several pods, bark pieces, oak cups and palm leaves and other palms debris. This type of floor environment provides a shelter for young fish and in addition it promotes a development of microorganisms – a source of natural food for fish. The pods provide Poecilocharax weitzmani a natural breeding environment, where males can find hiding places and encourage female to spawn. These elements of decorations were either purchased or collected from the environment in Singapore. The substrate is based on sand, soil, tree bark, crushed leaves and peat mixed all together. Water parameters: Temperature is 25.7°C (10-15 cm under water surface), pH in range of 4.70 to 5.10, GH < 1, KH < 1, Conductivity in range of 50-60 µS/cm. The water without mineral content is used. The minerals in the water are a result of decomposing elements of environment. Forest detritus and peat release tannins into water and as a consequence it is a blackwater environment with acidic water. Description of the area surrounding the biotope: One of scientifically least explored rivers is Rio Uaupes. Rio Uaupes has several tributaries, one of the them is left-hand Igarape Yavuari. Nearby there is a camp Yavuary that provides a base for further explorations. This region is inhabited by Tucano Indians, that Tucanoichthys tucano took the scientific name from. The biotope demonstrates a small forest brook that emptying into Igarape Yavuari. The ficus trees are dominating in the forest, while there are also leopoldina palms and other trees. The leaves and palms falling into the water causing a change in its chemistry. 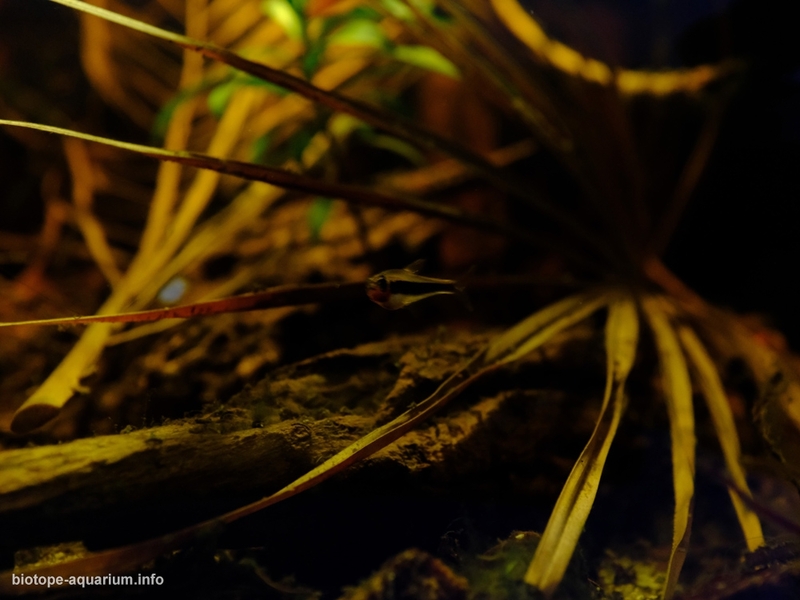 Description of the underwater landscape of the biotope: Coordinates of the biotope are 0 14″31″ N and 68 03″48″ W. According to J. Gery and U. Römer who explored the forest, the brook is 80-200cm wide, with 50-200cm deep near the end of dry season. The water runs relatively swiftly carrying forest detritus. There are chunky trunks of dead wood covered with a thick carpet of ficus leaves in the water. Leopoldina palms are lying in the water. There are terrestrial tree seedlings in the biotope. At the location, according to U. Romer expedition there were no submersed plants, while branches and roots provide shelter for aquatic organisms. A couple of pictures of the environment were offered in Uwe Römer books. Description of the parameters of the habitat: The soil is sandy, poor of mineral content, giving conductivity at 24 uS/cm. The air temperature is +29 C, while water + 26 C at the surface while + 25.5 at 30cm depth. As a result of large number of ficus leaves, palms, dead wood and other tree debris in the water, the brook is a blackwater environment that contains significant amount of tannins. As a consequence, Ph is reaching 4.10. List of fishes and invertebrates occurring in the nature biotope: The fish-fauna is quite poor in species of biotope. 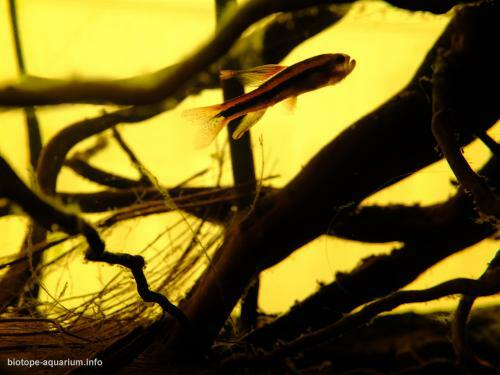 The exploration managed to collect the following species: Tucanoichthys tucano, Nannacara adoketa, Crenicichla sp., Catfish: Amblydoras sp., unidentified Rivulus, and Poecilocharax Weitzmani. 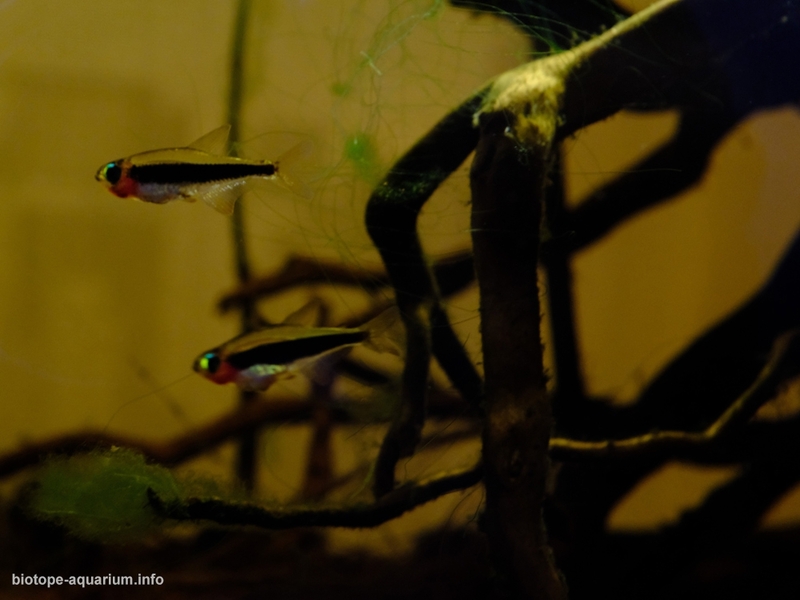 No Apistogramma species were collected despite Apistogramma Elizabethea inhabits Igarape Yavuari. List of plants found in the nature biotope: No aquatic plants were detected. 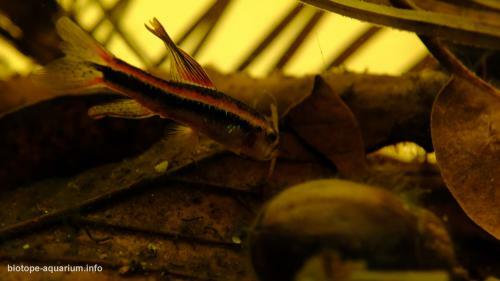 Threats to the ecology: Despite intense collection by J. Gery and U. Römer expedition, Tucanoichthys Tucano was found only along 200m of the brook and nowhere else. U. Romer says that existence of Tucanoichthys Tucano like other species inhabiting Rio Uaupes basin might be endangered in the future if the region becomes populated and polluted. Similarly, to Tucanoichthys, future of native inhabitants – Tucano Indians living along the banks of Rio Uaupes is in doubt. *Igarape Yavuari according to google map is Igarape Iauiari. ** Satelite location of the forest brook.